BlazBlue is a fighting game series with a complex plot and many interesting characters. Late last year, the BlazBlue story was adapted into an anime—poorly. But the anime was not the only adaptation to come out recently; a live-action play ran this past weekend in Tokyo. It was excellent. As a fighting game, BlazBlue has a lot of characters. One of the anime's biggest mistakes was trying to fit in all of them. The stage show, which cuts the cast down to seven, basically revolves around three plots: Terumi's evil plan; Ragna and Jin's ongoing conflict; and the testing of Tsubaki, Noel, and Makoto's friendship. Rachel just serves as a walking exposition dump and MacGuffin to get the characters from one fight to the next. This simplification makes the story much easier to follow—as does the fact that we only see one time loop. And the seven characters are all distinct in their motivations and appearance, so they are easy to keep track of as well. The entire set of BlazBlue is pure white—the stage, the backdrops, everything. This is because the show projects its backgrounds (often taken directly from the game) onto the set itself. The stage has many different levels and semi-transparent backdrops descend for certain scenes. There are even four small walls capable of being moved quickly behind the actors by hidden stage techs so that special effects like explosions or special attacks can be projected on them. Near the end of the play, Noel's entire costume with its floating blades is a special effect projected onto her white body suit and a semi-transparent screen. All in all, it looks very cool and allows for a lot of special effects-heavy action scenes you can't normally have in stage plays. 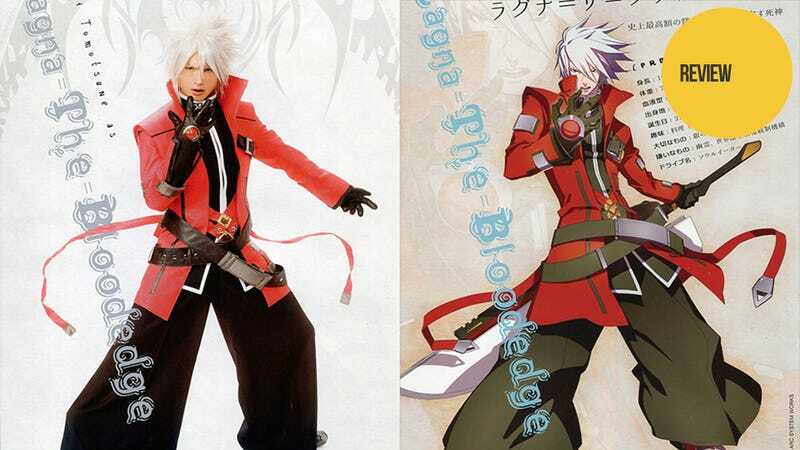 While Ragna is ostensibly the main character, it is Terumi who the play is centered around. He moves the play from scene to scene, instigating nearly every conflict or at least commenting on it after the fact. Terumi is over the top—sometimes deadly serious, sometimes descending into peels of insane laughter. Actor Kouhei Murakami portrays him perfectly. He steals every scene that he is in and brings the complex villain to life. Another standout performance was that of Misaki Momose who has the incredibly difficult challenge of portraying Noel’s descent from despair into madness. It is a scene that is both captivating and difficult to watch. The other characters are also well-realized and there is no weak link in the cast to speak of. BlazBlue is a fighting game and in keeping with the spirit of the series, the play also has more than its share of stage fighting. There are a good half dozen fights in the show's hour and forty-five-minute runtime and all are full of excellent choreography. This is then combined with the projection-mapping on the stage to recreate the character’s most fantastical fighting moves. The fights are great fun to watch and each character (sans Rachel) gets at least one chance to show off their moves. The BlazBlue game series is filled with made-up terms that describe everything from the weapons and attacks to the nature of the world. For most of the play, these are kept to a minimum. Terms like “Arch Enemy” and “Azure Grimoire” are used but easily understood in context. However, as the play nears its climax, it is necessary to explain what the villain is trying to do and to define the massive amount of incoming proper nouns. Thus, the play grinds to a complete stop for nearly five minutes in a joke scene where Makoto quizzes her subordinates on these terms and concepts. It is pure exposition with more than a little humor to take the edge off. However, in a play so dramatic and serious, it is completely out of place and destroys the play’s pace. Granted, we needed to get this information somehow for the plot to make sense—and a serious scene where the characters were talking about things they should already know would have been much worse—but this scene is still the weakest part of the play. In the end, Live Act BlazBlue ~Continuum Shift~ is a well-acted, well-realized adaptation. By streamlining the characters and story, it is able to hit all the emotional moments of the plot without getting too convoluted in characters and their motivations. While it has an issue with its overuse of terms specific to the BlazBlue universe, the play is still fun and easy to understand. And with the stage fighting and projection-mapping effects, it really is something special. Live Act BlazBlue ~Continuum Shift~ ran from March 6, 2014, through March 9, 2014, at the Galaxy Theater in Tokyo.